10 chickens, 4 ducks, and a beloved goose were killed at the San Miguel Community Garden near Rancho and Gowan. 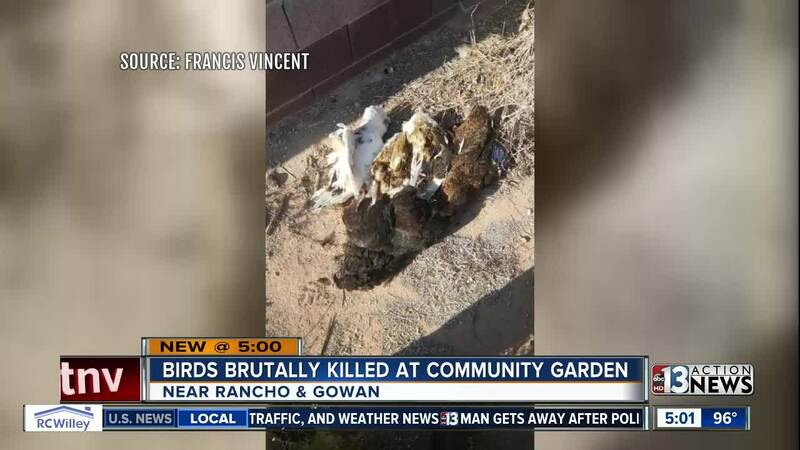 A local community garden is devastated after finding out that more than a dozen of their birds were killed. Volunteers at the San Miguel Community Garden near Rancho and Gowan came in Tuesday morning to find 10 chickens, 4 ducks, and their goose, Pickles dead. Volunteer Moe Bedard says the attack on Pickles was particularly brutal. "Grabbed his wings and broke his wings and left him to sit there to die," Bedard says. Police are investigating the case, but don't have any solid leads because there were no cameras. Meanwhile, the garden, which is run by volunteers, is having to amp up security. They say they haven't had any issues until this happened for the past five years. In fact, they've always left the front door unlocked so people could enjoy the garden after hours. But now, they say, they're having to install locks and lights. They're also hoping to raise money for cameras. If you want to help them out, you can donate on their GoFundMe page . A 13 Action News viewer who heard about what happened during a Facebook Live has also offered to donate cameras to the garden. We'll let you know when that happens.